(18/P029) TRENTON – The Department of Environmental Protection today marked Earth Week by planting a portion of Double Trouble State Park in Ocean County with Atlantic white cedar seedlings as part of special state reforestation efforts designed to repopulate this stately but ecologically stressed species. Students from Berkeley Township elementary schools took part in the planting, joining DEP Acting Commissioner Catherine R. McCabe and the New Jersey Division of Parks and Forestry to celebrate Earth Week during one of numerous ecologically themed events taking place across the state. Students attending the celebration included members of the Potter Creek Crusaders, an ecologically minded afterschool group of sixth graders at Berkeley Township Elementary School focused on the health of Potter Creek in the Barnegat Bay watershed, a waterway that flanks the school property. The goal of the program is to combine environmental education with community awareness. They were joined by several members of the Beautiful Earth and Air Keepers, an afterschool group from Berkeley’s Bayville Elementary School. The area around Potter Creek was once widely used and known for cedar production as well as bog iron ore smelting and production. Students in the program enhance and expand their knowledge about the relationship between the Potter Creek area and the Barnegat Bay estuary by hands-on experience and photographic documentation with guidance from environmental specialists and group advisors. A member of the cypress family, Atlantic white cedar is an evergreen that bears cones and can grow more than 60 feet high. It is noted for creating distinct and ecologically important stands along freshwater wetlands, bogs and creeks from Maine to Florida. The acreage of Atlantic white cedars along the East Coast has dwindled from about 500,000 acres to about 115,000 acres, or less than one-fourth of its original range. This tree has been eliminated from much of its range by logging, development, eating by deer, lack of management and other threats. Today it faces threats from sea-level rise caused by global warming. The Division of Parks and Forestry has been implementing a strong, science-based effort to strategically focus reforestation efforts to minimize the effects of sea-level rise. This involves conducting reforestation efforts in areas where the trees will be better protected from saltwater impacts. 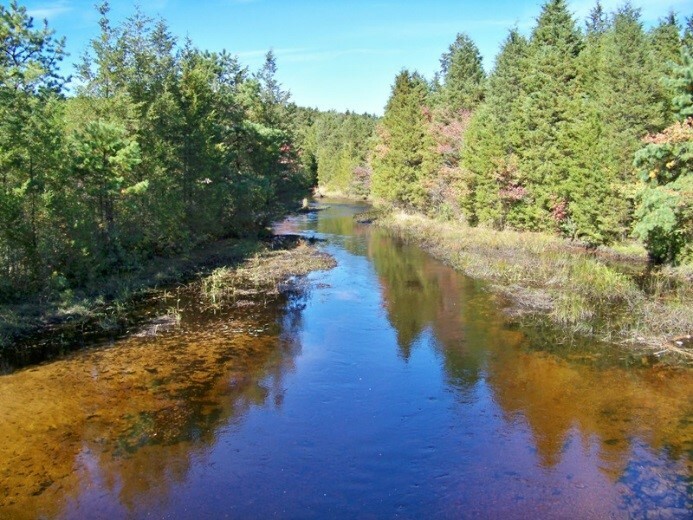 While predominant along freshwater wetlands and stream courses, the Atlantic white cedar is unable to tolerate saltwater. Superstorm Sandy in 2012 pushed saltwater up coastal creeks, damaging or killing many stands of cedar trees, creating “ghost forests” of bleached-white trees devoid of needles. The impacts of the storm led to efforts by the Division of Parks and Forestry to map areas that could be susceptible to similar events in the future. 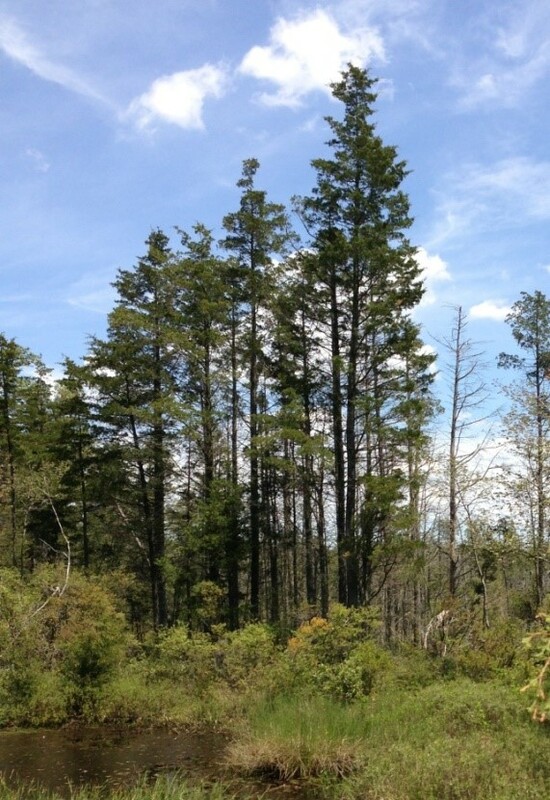 In October 2012, high winds from Sandy damaged 25 acres of Atlantic white cedar in Double Trouble State Park. Shortly after Sandy, the New Jersey Forest Service began the process of restoring Atlantic white cedars as part of the park’s Natural Resource Stewardship Plan. After three years of planning and consultation with internal and external stakeholders, the New Jersey Pinelands Commission approved the plan and launched it in 2016. Atlantic white cedar typically forms pure stands with thousands of trees per acre, nearly all the same age, standing straight and tall and creating dense, cooling canopies. Young cedar seedlings, intolerant of shade, require strong sunlight to grow. Stands will develop only after an area has been cleared and sufficient seed source provided. In New Jersey, Atlantic white cedar forests were once widely distributed across the state, with major stands in the Pinelands, the Meadowlands and Sandy Hook. Today, New Jersey’s strongholds are primarily in the Pinelands of Atlantic, Burlington, Cape May, Monmouth and Ocean counties. The Division of Parks and Forestry estimates that only about 25,000 acres of Atlantic white cedars remain in New Jersey. Historical records show that many Atlantic white cedars once grew in the area that is now Double Trouble State Park, an 8,000-acre park that preserves the history of the Pinelands’ cranberry and cedar industries as well as pristine Pinelands ecosystems. After intense logging, the cedars did not re-establish due to the lack of forest management, deer eating young trees, and competition from hardwood species. As a result, red maple and black gum trees now occupy many of the former cedar stands within the park. Cedar stands provide many benefits, absorbing pollutants from water, protecting stream banks from soil erosion, storing water in times of drought, and providing buffers to flooding. These high-density forests also make an ideal refuge for many species of plants and animals. The Pine Barrens tree frog, timber rattlesnake, barred owl, and black-throated green warbler live in cedar swamps. Also, a rare butterfly, Hessel’s hairstreak, lays its eggs on the foliage of the Atlantic white cedar. Once the butterfly larvae emerge, they feed on Atlantic white cedar foliage. The New Jersey Forest Service monitors and maintains 775,000 acres of state-owned open space. To keep forests productive, foresters foster species biodiversity, create wildlife habitats, suppress pest outbreaks, and restore ecologically significant areas. Management incorporates the best forest stewardship principles derived from a forest management plan developed with public input.